Lately, I found myself enjoying watching Digimon again. After 74 episodes, I felt the urge to find a Digimon game and I came across this demo. Since the game is just a short DEMO, the review will be brief. Warnings: There will be minor spoilers. Being this game just a short Demo, the review won’t be as long as usual. Your Digital Dream is an RPG game that takes place in the Digital World. 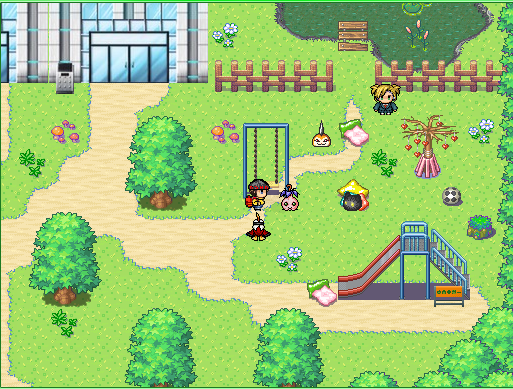 Despite several gameplay elements are in common with the Pokèmon games, the storyline resembles the ones in the Digimon anime series. Check out the creators’ game page on Pokecommunity for more information on the game updates. I found out that he also runs a YT channel where game trailers are posted, you really should give it a look. After the first connection between the Digital and the Real world, the contact was lost and the two worlds were unable to connect for some time until a company called Digital Dream was finally able to open the gate again. For the company’s first anniversary a campaign called Your Digital Dream was launched. During this event some kids are called to take part in a contest which could allow them to become Digimon Tamers and enter the Digital World. 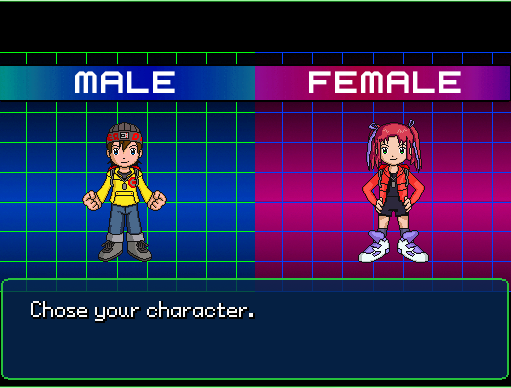 After the character and name selection, the player will be lead to the Digital Dream Center in which it will undergo a test to check whether it is suited for the role of a Digimon Tamer or not. The test consists in some question about general knowledge of the Digimon series. After the test is done, the player will undergo the digitalization process. During this phase, the future Tamer has to answer to one question of preference, a Digimon partner will be assigned basing on the answers given. (For example, I answered that I liked the 1st Digimon series best and that I would have represented the hope, thus, I was assigned Patamon as starter Digimon). The player will be given a Tamer Kit containing a Digivice and a Digimon Analyzer. While the Digimon analyzer is an instrument used to register the data of all the Digimon encountered and caught, the Digivice is a kind of a smartphone: it contains the map, the telephone, a jukebox(with which you can change your current music theme) and a registration of all the quests the tamer has completed or is still trying to. After the formal part is done, the proper Digital adventures begins. As anticipated before, the game dynamics pretty resembles the classical Pokèmon games with the due differences. Each Digimon Tamer can build its own Digimon Team by catching wild Digimon which can digivolve in different ways including: leveling-up, by items, happiness status, location… and all the Digimon stages (ex. Champion, Ultimate…) can be reached. During its adventure, the Digimon Tamer will have to protect the Digital world from enemies and find the eight crests (the ones from Digimon Adventure 01, I suppose) which will help him to defeat the dark forces. Alongside with the main plot, there will be side quests to accomplish. They’re not strictly necessary for the story but you will have nice and unique prizes if you solve them. All the quests are automatically registered in the Digivice, so you won’t forget about them so easily. 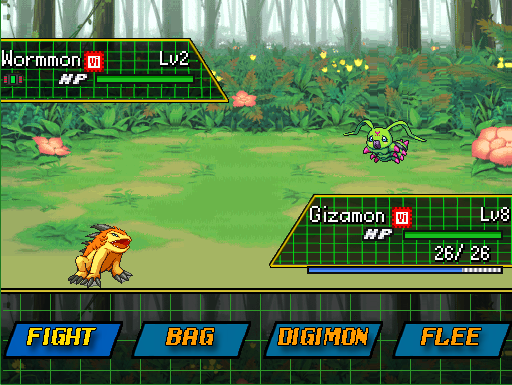 During the adventure, both Digimon enemies and human rivals (the other Digimon Tamers who won the Digital Dream contest) will challenge the player, just as in the Pokèmon games, player will be paid after a victory and will lose money after a loss and all the Digimon involved in the fight will earn experience points and reach further levels. Each location in the game is particularly well characterized. For now, being this just a Demo there are few, almost all of them have the nature as its primary theme. 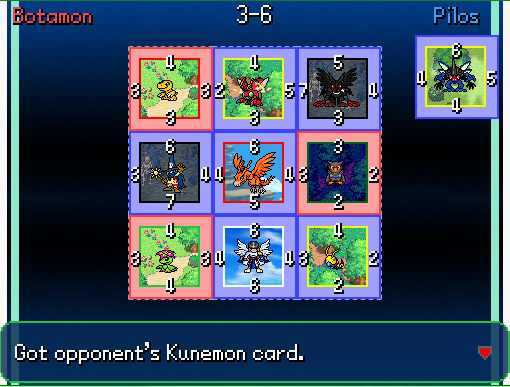 -The Card shop: in here you can buy Digimon cards that will allow you to play the mini card game. Despite this game is just a demo, there is a fair bunch of relevant characters. First of all, there are the other Tamers that were chosen alongside you, they will either act as friends-rivals or foe-rivals. In the first category, we find the childhood trusty mate that grew up with the main character and that starts the adventure with it (it will be Kira, if the player is a boy or Junior if the player is a girl). The player will encounter some of the other friend-rivals in different occasions. foe-rival who gave me the impression of being up to absolutely no good that will pop in the middle of nowhere just to throw spanners in the works. just like the childhood friend, also the main foe-rival change according to the player gender (A boy if the player choose a boy or a girl if the player is a girl). other characters of interest are Lucy, the Tamer's assistant and Dr. Fish, Digital Dream's founder. 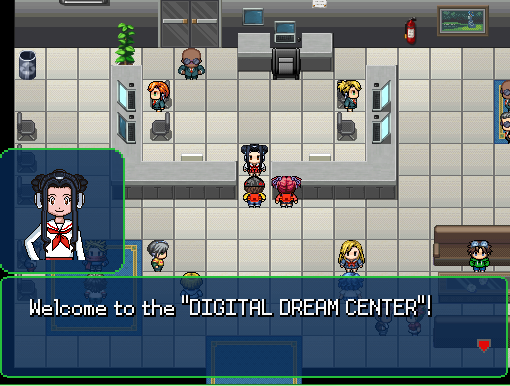 Lucy will be very present at the very early stages of the game: she's the one who follows the player throughout the entire digitalization process.She's also the one in charge for healing Digimon at the Digital Dream center. As you might squint, enemies don't lack. During its adventure the Tamer will also face Digimon enemies. 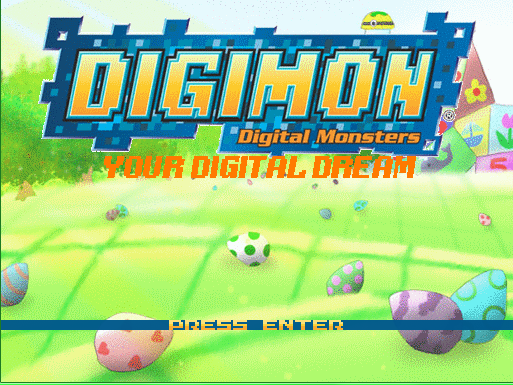 A fair amount of Digimon is available in this game towards different means, including digivolution. Similarly to Pokèmon HGSS games, the Digimon will follow the player around, pressing the Ctrl button, the lead Digimon will be switched. The Tamers' Assistant at your service! 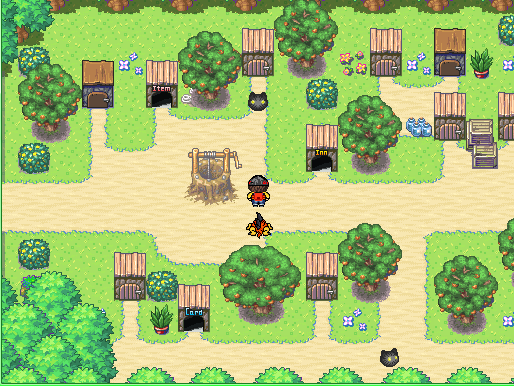 Botamon Village as an example, the music theme change according to the building you enter: the card shop has is different from the item shop and the inn, and the all of them are different from the village. This succeeds to build the right atmosphere at every moment of the gameplay. Basing my opinion strictly on this Demo, i think the game has a lot of potential that will most likely be best expressed in the future, as it will get updates: characters are well studied and developed, the locations are varied, the plot is intriguing and the music almost always fitting. This is an optimal mix to create an enjoyable game. I'm really looking forward to further updates, and I suggest to all the people reading this post to try this game out, at least to taste something different from the classical Pokèmon games. how do i increase my digimons happiness?